Cory Doctorow signed my Kindle! 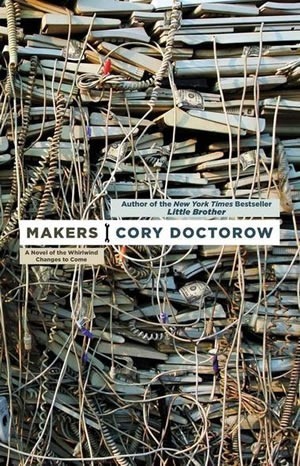 Cory Doctorow's most recent adult book, "Makers"
Cory Doctorow was at the school I teach at today, speaking to kids. He was doing a book tour for his new YA book, For the Win. He read an excerpt, talked about the book, then talked about his views of economics that related to the book, and then about Creative Commons Licensing and internet privacy. 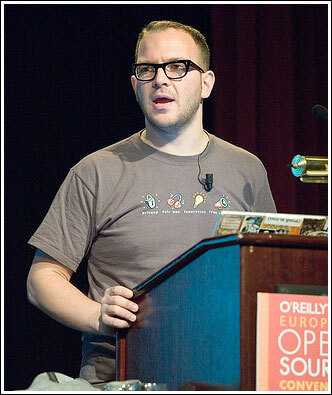 His talk was excellent. He’s a very articulate guy as well as a very interesting writer. He had a bit of time afterwards to sign books. I got him to sign my copy of Makers, his newest adult science fiction novel, and then he signed my Kindle, which had a copy of Down and Out in the Magic Kingdom, his first novel, on it. Very cool! Check out his stuff. His imaginings are for a future not that far away, and he does a job of extrapolation as good as any of the great skiffy writers of the 50s, save maybe Heinlein himself. His extrapolations are not just technological – those are almost secondary – they are social, mainly. He also is bold enough to put his books out on the web for free at the same time they appear in print. He doesn’t think it hurts his sales. I think it’s interesting that he chooses that model, Baen chooses ebooks with no DRM, and practically everyone else locks things down. We’ll see how it shakes out as ereaders become more common. Anyway, great stuff, highly recommended. And thanks, Cory, for signing my Kindle! You are currently browsing the The Old Gray Cat blog archives for the day Tuesday, May 11th, 2010.